The methodology of treating MARC21 variable data field tags as aggregated statements in RDF is discussed in Taggregations. There are some circumstances when this approach is redundant and level 0 RDF properties based on individual subfields can be used directly in MARC21 data triples that are semantically complete and coherent, and in mapping triples relating MARC21 to other metadata schema. We can by-pass the need for an aggregated statement when there are no semantic dependencies between the subfields of a tag, and thus net more low hanging MARC fruit. The most obvious case is when there is only one subfield in the tag: the contents of the tag are the same as the contents of the subfield. 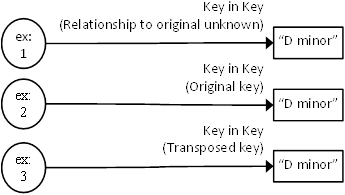 Note that the repeatable status of a tag is, generally, not relevant as there is no intrinsic semantic dependence between multiple occurrences of a tag in a record. There appear to be no MARC21 tags with just one subfield, but I think it is reasonable (at this stage of analysis) to ignore the Linkage subfield ($6) and the Field link and sequence number subfield ($8), although further investigation is required. For example, the level 0 property (m21:M515__a) for subfield a of tag 515 “Numbering Peculiarities Note” can be used directly for a data triple. In this example, a MARC21 record for a resource (ex:1) has two occurrences of tag 515, and the same level 0 property can be used directly to express the data in RDF, without the need for an aggregated statement property for the tag. Thus the appropriate level 0 property for subfield a of tag 384 “Key” can also be used for data triples. There are three properties available (m21:M384__a, m21:M3840_a, m21:M3841_a), each based on a different first indicator value (#, 0, 1). In this example, the MARC21 records for three different resources (ex:1, ex:2, ex:3) have an occurrence of tag 384, but with different values for the first indicator. For example, the level 0 properties for subfield a and subfield z of tag 088 “Report Number” can be used directly for data triples because there is no need to keep a report number ($a) together with a cancelled or invalid report number ($z).